Jam on at the Carlsbad Music Festival all weekend long. Whether you like classical, jazz or pop, you’ll have fun at this festival and its long list of performers. Exhibits. Opening this weekend: Best of Nature Photography at San Diego Natural History Museum (Tuesday), Lost in the Memory Place at MCASD: La Jolla, Scripps on Prospect at MCASD: La Jolla, Dana Montlack: Sea of Cortez at MCASD: La Jolla, Outside at Oceanside Museum of Art, Jim Machacek at La Jolla Athenaeum and Roots at La Jolla Athenaeum. Closing this weekend: Pictures of the Year International at Museum of Photographic Arts, Volcanos and Full Moons at Oceanside Museum of Art and Ain’t Nothing Like a Dame at Spanish Village art Center (Monday). Get a tan at the Chula Vista HarborFest. Happening on Saturday, the Fest features art, music, activities, harbor activities and food. Walk around the Arts Alive on the Coastal Rail Trail on Sunday. Music, food and art, along with the official reopening of the 101. Enjoy the weekend with the Mira Mesa Street Fair on Saturday. Entertainment, crafts, food and a well stocked beer garden–yes! Have a ball at the Pacific Islander Festival 2013. The Festival features cool music, fun dance, yummy food and great people watching. And it’s happening all weekend! Bring the fam to the Hullabaloo Family Arts Festival at the Del Mar Fairgrounds on Saturday. This celebration of music, dance, art and more is sure to be a fun time. Listen to some tunes at the Julian Music Festival on Saturday. It’s the 44th year to celebrate music and the end of the Summer in Julian and it’ll be a fun one. Say ‘om’ at the One Love Yoga San Diego event on Sunday. If you’re a newbie yogini, active yogi or are practically buddha, you’ll enjoy this great yoga event at the Del Mar Fairgrounds. Celebrate Fall at the 2013 Encinitas Oktoberfest. Yes, Fall activities are starting! Go to one of the first Oktoberfest festivities in SD! *Bonus: BunnyFest 2013…Sunday…Balboa Park…yes, bunnies! Viva el Mariachi Femenil!, Women’s Museum of California. Learn about the history of women mariachis and women groups with this exhibit. Opens September 6th. A VALYA Retrospective, Visions Art Museum. See the career work of the fiber artist, VALYA. Felting opens at the same time! Opens September 6th. MENAGERIE, Mingei International Museum. This exhibit includes great art incorporating animals from many different periods and cultures. Closes September 8th. Matthew Cusick, Lux Art Institute. So excited about this exhibit: Cusick creates pictures by using thread from interesting sources like textbooks and maps. Opens September 8th. Arnold Newman: Masterclass, San Diego Museum of Art. If you love black and white photography, you must go before it closes this weekend. TRASH, The New Children’s Museum. 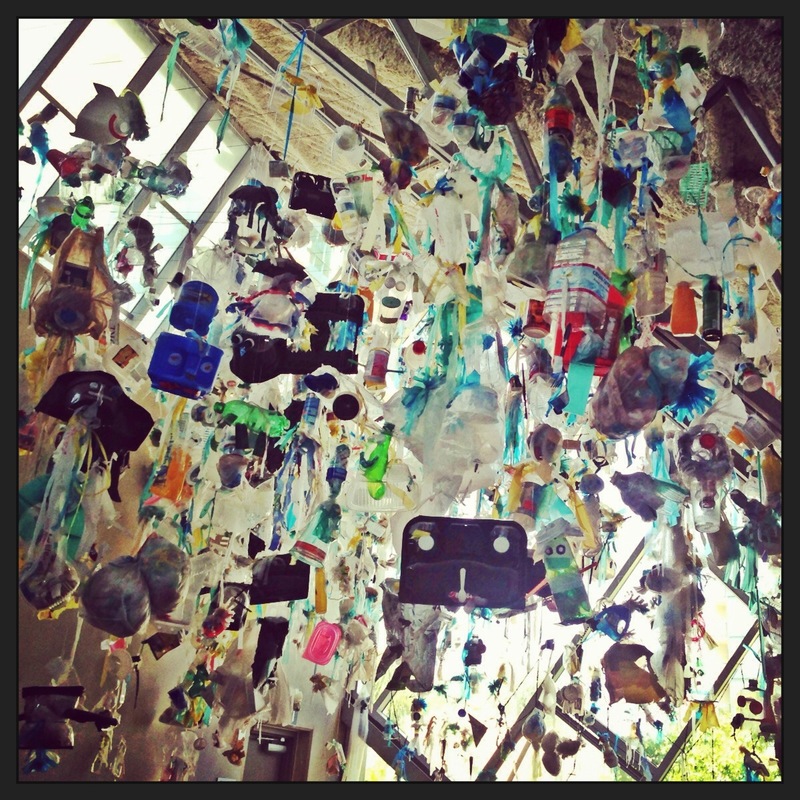 If you want to see different artists using trash in new ways, visit this exhibit before it closes on the 9th. 16th Annual Galaxy of Glass, Fallbrook Art Center. See glass sculptures, vessels, jewelry and more. And buy some of the pieces too! Opens September 8th. Landscapes Rediscovered, San Diego History Center. You know you love San Dieo’s beautiful landscape. Admire it in art by famous San Diego artists of the Depression era. Closes September 10th. Beyond the Book II and First Impressions, University of San Diego. USD’s art galleries are pretty amazing. Come see why with two exhibits that showcase their print collection in different ways. Opens September 12th. Looking for Things: Jay Johnson, Oceanside Museum of Art. Johnson is an eclectic artist who works with reclaimed pieces in interesting ways. Closes September 15th. While you’re there, Volcanos and Full Moons closes this month too. A Sweet Life, San Diego History Center. Learn about San Diego’s history in the candy business…sweet! Opens September 6th. Concert of Color, Mission Trails Regional Park. Features different styles of art by award winning artists. Closes September 20th. Dana Montlack: Sea of Cortez, Museum of Contemporary Art San Diego: La Jolla. See biology, oceanography, taxonomy, literature and more as it’s combined by photographer Montlack in this exhibit. Opens September 21st. ROOTS, La Jolla Athenaeum. Artist Mary Ellen Long is a collage and multimedia artist extraordinaire. See her newest installation when it opens on September 21st. Pictures of the Year International, Museum of Photographic Arts. See the best documentary photography in the world before it closes September 22nd. Car Toys, San Diego Automotive Museum. This exhibit showcases some cool car toys from the past to today. Need we say more? Closes September 29th. The Harp, Museum of Making Music. Become an expert on the harp this month and learn its place in the history of the human race. Closes September 30th. On the Fly: Technology Takes Off, Reuben H. Fleet Science Center. See unmanned aerial vehicles fly and create your own aircraft at this interactive exhibit on flight technology. This exhibit just opened. Faces of Japan, Japanese Friendship Garden. We are so excited to see this exhibit with photos of everyday scenes in Japan. Just opened on August 1st. 22nd Annual Juried Exhibition, La Jolla Athenaeum. See the winners of one of the most prestigious juried shows in San Diego. Opens August 3rd and closes August 31st. Ecclectic Eyes, Spanish Village Art Center. See fine art photography at this free show in the Village’s Gallery 21. Opens August 14th and closes August 26th. 125 Years of the Hotel Del, Coronado Library. Maybe it’s because we love libraries and we love Coronado’s specifically, but there’s something so great about a public space that appreciates art and history. This is one cool show of San Diego history. Struck By Modernism, Mingei International Museum. Cool sculptures and other pieces by a blacksmith artist await you at this exhibit. It includes gates, chandeliers and free-standing sculpture. Opens August 24th. Intersections: Charles Arnoldi, Oceanside Museum of Art. See one of the most significant abstract artists of the last century before the exhibit closes on August 25th. Earthly Elements, Fallbrook Art Center. This exhibit features pieces made with earth/natural materials. See fiber arts, ceramics, wood art, gourds and more. Closes August 25th. Hito Steyerl: Guards, Museum of Contemporary Art San Diego: Downtown. Learn about the multiple lives of museum guards with this cool exhibition. Second Time Around: Fashion Recycled, Visions Art Museum. Explore designer pieces created from recycled materials with this exhibit. Two other exhibits close at the end of the month as well: Supporting Roles and Fashion Tops and Bottoms. ‘Dare to Reuse’ Student Art Exhibition, The New Children’s Museum. See the student winners of the ‘Dare to Reuse’ art contest. Closes August 26th. Landscapes Rediscovered, San Diego History Center. This exhibit displays beautiful landscapes by San Diego artists. Closes September 10th. Approximately Infinite Universe, Museum of Contemporary Art San Diego: La Jolla. Explore art by various artists inspired by the science fiction realm. Closes September 1st. Wonder Woman: On Paper and Off, Women’s Museum of California. Visit this exhibit to learn about the history of women in comics. Do it before September 1st when it closes! The Magic of Windansea, California Surf Museum. Learn about the famous Windansea Surf Club and see artifacts from their history. Closes September 1st. Deadly Waters 2013, Living Coast Discovery Center. See dangerous water animals up-close and personal! Closes September 2nd. Bold, San Diego Natural History Museum. Learn about the art of DNA barcoding with this interactive sculpture series. Closes September 8th. Tony Delap: Selections from 50 Years, Oceanside Museum of Art. See an exhibit highlighting many different medias from the minimalist’s great career. Opened at the end of June. Arnold Newman: Masterclass, The San Diego Museum of Art. See over 200 works by one of the best portrait photographers of the 20th century. Opened at the end of June. Proyecto 5, Centro Cultural de la Raza. See Mexican artists with an eye toward the global vision of contemporary Mexican art. Opened at the end of June. PhotoArts Group Presents “America”, Spanish Village Art Center. Photos highlighting American landscape, culture and more await you here. Opens July 3rd and only goes until July 15th. Mammoths and Mastodons: Titans of the Ice Age, San Diego Natural History Museum. See fossils, mummified mammals and more in this great new exhibit. Opens July 4th. ElasmoBeach, Birch Aquarium. See sharks, rays and other close to shore creatures at this new exhibit. Opens July 4th. Liza Lou: Color Field, Museum of Contemporary Art San Diego: Downtown. Great exhibit that we helped to install! Opens July 12th. Celebrate the Horse, Fallbrook Art Center. Celebrate the horse in popular culture but do it soon! Closes July 14th. Kingston Trio, Coronado Museum of History and Art. Learn about the great band (Kingston Trio) and their ties to San Diego. Closes July 15th. Pictures of the Year International, Museum of Photographic Arts. See some of the best documentary photography in the world! Ripley’s Believe It or Not, San Diego Air and Space Museum. Huge exhibit with strange animals, people and things. This exhibit hasn’t been to San Diego since 1935! In and Around Mission Trails, Mission Trails Visitor Center. Featuring two artists with paintings of scenes around the Park! Started at the end of June and closes on July 26th. Melissa Miller, Lux Art Institute. Miller explores the relationships between humans and animals in her beautiful work. Closes July 27th. Make Your Own Kind of Music, Mingei International Museum. Learn about the art of making musical instruments (and hear some of them while you’re there!). Closes July 28th. Handcrafted Journeys: Japanese American Woodworkers in San Diego, Japanese Friendship Garden. Visit to see how Japanese American woodworking has evolved over the years. Closes July 28th. TRASH, The New Children’s Museum. If you have kids, and especially if you’re eco-friendly, visit this exhibit. TRASH involves 12 different artists showcasing art made from trash to give visitors a new perspective on everything trash involves. Marston House. Go for a house and garden tour. Open Thursday-Monday. Summer is the best time to go to this amazing example of old San Diego! Car Toys, San Diego Automotive Museum. Starting June 7th, this fun exhibit opens to the delight of car toy fans everywhere! Great Balls of Fire, Reuben H. Fleet Science Center. If you want to learn more about comets, meteors and asteroids, including how likely it is for one of them to hit the earth and cause massive damage, go see this exhibit. Be sure to go before it closes on the 11th. Approximately Infinite Universe, Museum of Contemporary Art San Diego: La Jolla. Science fiction and art collide with this exhibit. See art inspired by such topics as space travel, utopian futures, other worlds and other beings. Opens June 8th. Duncan Gleason: California’s Maritime Art Master, Maritime Museum of San Diego. This exhibit features 40 paintings by Joe Duncan Gleason who was a renaissance man best know for his maritime and harbor scenes. Opened at the end of May. Second Time Around: Fashion Recycled, Visions Art Museum. June 7th brings two new exhibits to the Museum: Second Time Around along with Supporting Roles: Photographs and Fiber from Ann Scott. Wonder Women: On Paper and Off, Women’s Museum of California. Great exhibit showing the history of women in comics. Sure to be a hoot! Starting June 7th. Intersections: Charles Arnoldi, Oceanside Museum of Art. Come to this exhibit to see some of Arnoldi’s constructions and sculptures, the very pieces that started him on the road to become one of the most significant contemporary abstract artists of our time. Opens June 8th. San Diego County Fair! The Fair opens June 8th and runs through July 4th. Be sure to check out the great art exhibits the Fair features while you’re there. See fine art, photography, youth art, gems and minerals, the featured Game On! exhibit (this year’s Fair theme is games) and way more. The Magic of Windansea, California Surf Museum. Learn about the history of the famous Windansea Surf Club from our very own town of La Jolla. Opens June 8th. Allied Craftsmen Today, Mingei International Museum. See the current work of the amazing San Diego craftsmen group, Allied Craftsmen, with this exhibit. Opens June 15th. Life Force Without Limit, San Diego Chinese Historical Museum. This exhibit features the calligraphy of Tom Chow, a master calligrapher who’s work is influenced by his Chinese heritage along with his Californian life of the present. Opens June 15th. Hamilton Press Lithographs, La Jolla Athenaeum. See the lithographs from many artists of the famous Hamilton Press. Closes June 15th along with the 11th Annual SDSU Art Council Recipients exhibit. Lilia Gracia Castro, Centro Cultural de la Raza. See this Mexican-American’s solo exhibition giving a contemporary view of pre-Hispanic art. Closes June 16th. Celebrating the Horse: In Art, Culture, Sport, and Everyday Life, Fallbrook Art Center. Go to the Center on June 16th to learn about the horse in all aspects of society. Origins of Life, Reuben H. Fleet Science Center. This exhibit replicates famous experiments that simulated early Earth’s atmosphere in order to try to create life. Closes June 23rd. Scoli Acosta: ELEMENTALISTHMUS, Museum of Contemporary Art San Diego: Downtown. This exhibit features found objects made into “tambourines ” by Acosta. Closes June 23rd. access/ABILITY, San Diego Museum of Man. Visit this exhibit to gain understanding for people living with disabilities. Full of hands-on activities and real life examples. Make sure to see it before it closes on June 30th. Watch some amazing men and women play tennis at the La Jolla Beach and Tennis Club for the National Senior Women’s Hard Court Tennis Championship and the LJBTC’s Annual Spring Senior Championships. The tourney ends this weekend. Exhibits! Closing this weekend: HERB TURNER: REALIST/IDEALIST at Oceanside Museum of Art, Jessica Lange: unseen at Museum of Photographic Arts and James Chronister at Lux Art Institute. Partake in Art Museum Day and International Museum Day (Saturday and Sunday). There are two museums in San Diego partcipating: MCASD and SDMA. Head out to Mission Trails Regional Park for Explore Mission Trails Day on Saturday. Enjoy walks, talks, activities and even Ms. Frizzle (remember her from The Magic School Bus?). Enjoy the festivities at the Sicilian Festival in Little Italy on Sunday. Sicilians know how to have a great time with food, drink and fanfare so it’s a sure bet! Be part of the crowd at the North Park Festival of the Arts on Saturday. Performances, local beer and the North Park Craft Mafia take over the streets of North Park and want you there too. Get cultured at the Festa do Espirito Santo 2013 in Point Loma. Happening all weekend, this event is organized by the United Portuguese S.E.S. Walk the Escondido Street Faire on Sunday and see over 700 booths, entertainment, activities and the Farmer’s Market. See some stars at the 15th Annual Celebrity Golf Championship today through Sunday at La Costa Resort and Spa. Go and see Ray Romano, Mike Eruzione, Bruce Jenner, Steve Finley, Quentin Jammer and the host of the tournament, Marshall Faulk. Have your art appraised for free on Saturday. This is kind of a big deal! If you don’t have art but love antiques, go to one of these two antique shows this weekend: Antique Street Faire in La Mesa and Wine Country Antique Show in Temecula. *Also this weekend–go see Star Trek! We want to see more of these movies in the next few years…do us a favor and see it so we won’t have to wait another 4 years for the next one to come out. Lifelike, Museum of Contemporary Art San Diego: La Jolla. This exhibit ends at the end of May and gives viewers a chance to see ordinary objects in unusual ways. Go see it before it leaves! Lilia Gracia Castro, Centro Cultural de la Raza. See this Mexican-American’s solo exhibition giving a contemporary view of pre-Hispanic art. Starts May 10th. Bill Traylor, Mingei International Museum. A great exhibit showcasing one of the best artists from the American South. Ends May 12th. Dr. Entomo’s Palace of Exotic Wonders, San Diego Natural History Museum. See creepy, crawly and unusual bugs at this exhibit designed to look like a circus sideshow. Ends June 2nd. Hamilton Press Lithographs, La Jolla Athenaeum. See some amazing lithographs from the 23-year old company. Starts May 11th. Alternative Accounts, The San Diego Museum of Art. This exhibit was organized by UCSD students and highlights Plains Indian Ledger Art. Ends May 28th. James Chronister, Lux Art Institute. Chronister does amazing work by using black dots on white to create detailed landscapes, interiors and more. Ends May 18th. Handcrafted Journeys: Japanese American Woodworkers in San Diego. Japanese Friendship Garden. See the evolution of woodworking techniques and products by Japanese-Americans. Started May 3rd. HERB TURNER: REALIST/IDEALIST, Oceanside Museum of Art. This exhibit gives viewers a chance to explore works delving into social commentary by a local artist. Ends May 19th. Slice of Truth, the Reality of the Renaissance, Timken Museum. See one of Giovanni Battista Moroni’s masterpieces (the first time this masterpiece has been seen in the western US in fact!). Started May 2nd. 52nd International Exhibition, San Diego Art Institute. See the winners of this international art contest. Ends May 26th. Jessica Lange: unseen, Museum of Photographic Arts. This photographer’s solo exhibit documents cultures seen in her travels throughout the world. Ends May 19th. Deadly Waters, The Living Coast Discovery Center. Visit the Center to see deadly fish and other water animals. Just opened at the end of April. 11th Annual SDSU Art Council Recipients, La Jolla Athenaeum. See some artwork by scholarship winners at State. Starts May 11th. Young Art 2013: The Story of Me, The San Diego Museum of Art. See the biyearly art show of kids K-12. Ends May 26th. Prospect 2013, Museum of Contemporary Art San Diego: La Jolla. This exhibition gives viewers a view on the art scene of today. Ends May 27th. Rites of Passage, San Diego Museum of Man. Great exhibit giving visitors a chance to explore the different major life events throughout cultures, countries and religions of the world. Started in April. The Wanderer Guides on Facebook! The Wanderer Guides on Flickr! The Wanderer Guides on Instagram! The Wanderer Guides on Pinterest! The Wanderer Guides on Twitter!